Site inspection requires a range of portable testing equipment and having all the instrumentation and equipment in convenient Inspection Kits is more efficient. 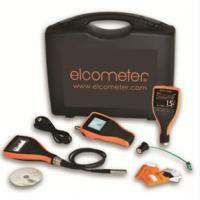 Elcometer offers one of the widest ranges of inspection equipment available. Their products are used across numerous industry sectors. In all cases, there is always a need to undertake a number of specific inspections during quality control assessments – as one parameter can affect another. Elcometer has put together a number of inspection kits which are both product and industry specific – combining those gauges from our range into one robust carry case, ideal for transporting to and from the inspection site. Available as a Basic or Top version, these digital kits have been specifically designed to undertake the three principal inspection requirements in the Protective and Industrial Coatings Industry – climate, surface profile and dry film thickness. There are 4 options with a Ferrous Basic Kit, a Ferrous and Non Ferrous Dual Basic Kit, Ferrous Top Kit and a Ferrous and Non Ferrous Dual Top Kit. The Basic Kits do not have the facility to download readings while with the top Kit all 3 models have the ability to download the readings and generate reports at the touch of a button. Report generation is becoming more and more important in the coating inspection process. It is therefore ideal for ‘paperless’ quality assurance systems the kits come complete with ElcoMaster® Data Management Software for professional reporting and analysis.